Flowers are lighting our life with their beauty and smell. But flowers’ power is not only about their beauty but also because of their deep meanings. Every flower represents some values. In addition it is certain that they are the best and indispensible gifts for special days. Most important days of our life, birthdays, valentine’s days, and graduation celebration are the days which deserve flowers. The meaning of the flowers is deeper than we thought. It is up to you to choose your flower according to their meanings. So let’s check the meaning of the flowers. As everyone knows, roses are symbols for the love, passion and beauty. Roses are irrevocable for Valentine ’s Day. Red Roses are definitely the representatives of love and moreover it symbolizes deep feelings to your partner. Red roses are the most romantic and scented flowers in the world. White roses represent a new and a clean beginning. Moreover, it represents sympathy, honesty and being humble. Yellow roses symbolize vitality, joyfulness and warmth. They also represent platonic love. Pink roses symbolize kind feelings, purity and cuteness. Purple roses represent love at first sight because of their colors. They are good alternatives to red roses. Black Roses are different from other roses. Roses have black ones and differ from other flowers with this qualification. Black roses are hard to find and this is the reason why they are expensive. Black roses represent death and loss of hope. They also represent an end for a relationship and love. Their meaning is to say goodbye to a lover. It is also a good idea to make a bouquet with different colors of roses to express your feelings. We can say that tulips are the most important flowers for Turkey since Netherlands which is the most productive country for tulips in the world learned tulips from Ottoman Empire’s gifts. Tulips give people a relaxation and warmness. They also called ‘’honorable flowers’’. Tulips are good choices for marriage anniversaries, wishing good luck to a friend or for your family members. Yellow tulips symbolize desperate love. If you buy yellow tulips for someone it means you love that person unconditionally. Red tulips mean passion and perfect love. It is not right to give red tulips to a family member or a friend. Purple tulip means wealth and welfare. Pink tulips meaning is love for family or friends. The first thing which occurs our mind when someone says daisy is daisy fortune. Daisies are the first witness to every platonic love. These beautiful flowers which we expect love from their leafs represents innocence and new beginnings. Moreover it can be a good choice for newly moms. These gerber daisies with their shiny and colorful forms looks like daisies and come from South Africa. They live long and they are strong. They symbolizes innocence, pureness and beauty. Gerber daisies are perfect gifts for someone who makes big changes in his or her life. Red Gerber means purity and innocence. Pink Gerber can be a beautiful gift for a new baby, yellow gerber represent joy and orange gerber means realism and irritability. It is certain that the most delicate and feminine flowers are lilies in the world. They can also be a good choice for the ones who love scented flowers. Peru lily also called as friendship flower. It can be a good choice for wishing good luck to a friend. Narcissus lily means extraordinary beauty. Kalla lily means purity, innocence and youth. This is the reason why it can be a good choice for bridal bouquets. It also called bride flower. White lilies are the most preferred ones among lilies. White lilies also can be used for bridal tables or wedding guest tables. Orange lilies represent greed and yellow lilies represent joyfulness. Orchids are very sensitive flowers and it is so hard to raise one. This is the reason why they are so famous. They can be found in Singapore, Thailand and China. They represents luxury, power of women and exotic beauty. Red orchid means passion and lust. It also symbolizes power and courage. Pink orchid means joy, innocence, purity and being chic. White orchid means respect. Purple orchid means success. Yellow orchid means friendship and new beginnings. Green orchid is considered to bring good fortune and money. Gillyflowers’ meanings differ from color to color. Red gillyflower represents pain sharing on deaths, massacres or memoires. It represents deep love and missing to the death person. If you give yellow gillyflower to someone it means that you are disappointed. White gillyflower means pure love and emotions. It is the best choice to give someone if you want forgiveness or if it’s someone’s birthday. Pink gillyflower symbolizes unforgettable things. Lilacs are symbols of the love. Moreover they represent the trust and success. This is the reason why they can be a good choice for graduation celebrations. Purple lilac means first love, pink lilac means strong friendships, blue lilac means peace and white lilac means innocence. Lilacs are the symbol of love. In addition, lilac flowers also reflect the trust of the person who gives the flower to someone. So, it will be a good choice for graduations. Purple Lilac Flower: It refers to first love. Pink Lilac Flower: It is associated with love and strong friendships. Blue Lilac Flower: It means happiness and peace. White Lilac Flower: Represents innocence. Irıs means in ancient Greece ‘’rainbow’’. Ancient Greeks put iris flowers to death women’s grave and they believe that goddess Iris will take these women to her heaven. Blue iris flower represents faith, white iris flowers mean purity, purple iris flower means wisdom. Iris means ‘rainbow’ in ancient Greek. Old Greeks planted iris flowers in the graves of women and they thought that they would convince the goddess Iris to take her love to the jenny. It would be suitable for funeral and festivals. Blue Iris Flower: Symbol of hope and faith. White Iris Flower: It brings purity and innocence. Purple Iris Flower: Represents wisdom, respect and praise. For hundred years people have known lavenders as healthy, soothing flowers. Besides their physical beauty, they also know as therapeutic flowers. In addition, lavender flowers mean elegancy. White lavender means to have a wish which come true. Purple lavender means high purposes. These are one of the most popular flowers in the world. They are good choices for wedding ceremonies, marriage ceremonies, traditional Indian weddings, European weddings and civil marriage ceremonies, wedding dinner receptions. They represents love, marriage, romance, they are good for marriage proposals. Violet flowers meanings differ from color to color and the meaning depends on the person who is sent. Inconstant Violet means ‘’you are always on my mind and I enjoy it.’’ Blue violet means love and royalty. It is perfect to give a message of ‘’I’ll be royal to you.’’ Yellow violet means high values and goodness. Wedding city Antalya is a multinational wedding planner company. We can make your wedding dream come true. We will make the best decoration for you on your wedding day with best flowers. Please contact us to get information about our decoration, flowers and wedding packages. 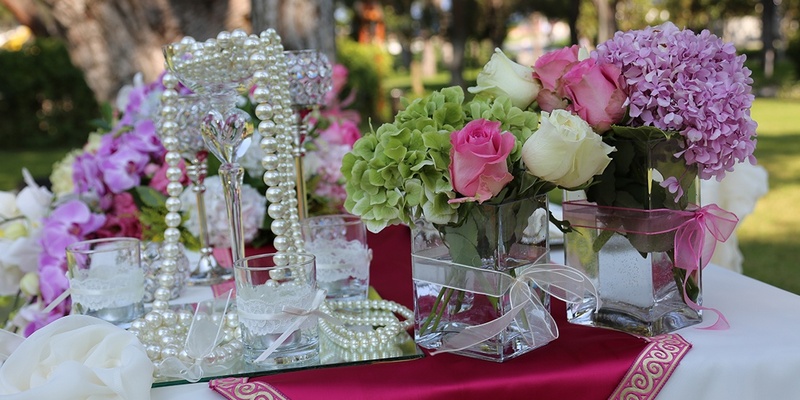 Our team has all the knowledge about flowers and ready to decorate your wedding with the most beautiful flowers.